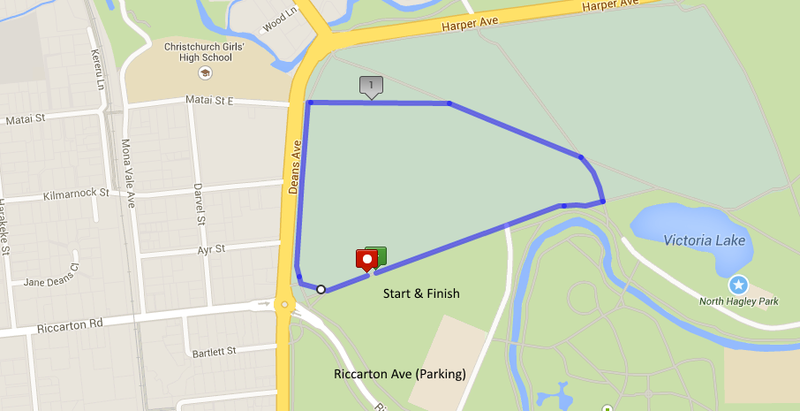 The race has a start and finish in North Hagley Park, close to the intersection of Riccarton Road, Riccarton Ave and Deans Ave. See the map below. The course uses a loop of approximately 1.6KM although this has been measured for the 5KM events to ensure the distance and reflected times are as accurate as possible taking into account the start and finish. The surface is all concrete apart from the finish which has a 50m grass surface. Runners/walkers can elect to run on the grass beside the concrete path if they prefer. After the race, help yourself to some of the free refreshments or visit our sponsors stands for information about their products including running gear. After the last runners/walkers are in, spot prizes for the 5KM fun run/walk are presented (each night). On the final night for the series, the performance prizes and trophies are presented for the Athletic New Zealand Registered runners who have competed in the registered runners race. To view the rules and system used to calculate the various performance places, please see the below document.